There are two main parts to Cancellation Insights. 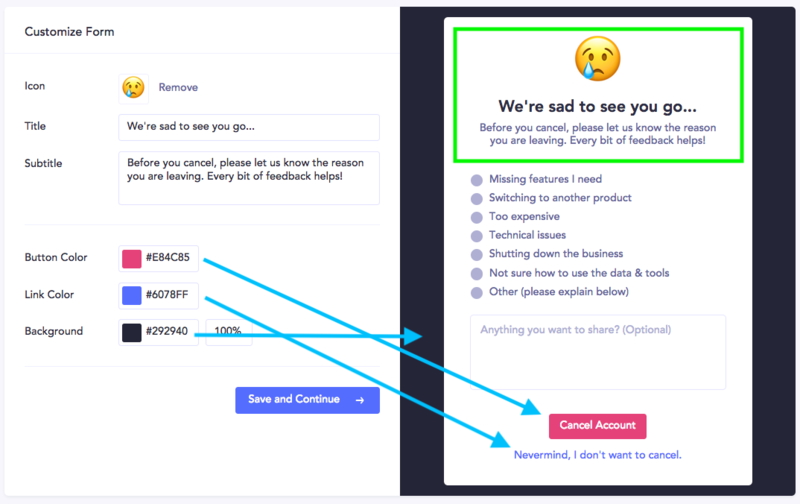 The customizable "Reason for Cancellation" form you embed into your app: we gather the data about why your customers cancel and provide reporting about why your customers leave. The automated follow-up email campaign that reaches out based on the customer's cancellation reason. The email campaign is entirely optional, but the embedded form is essential to Cancellation Insights. To get started, you'll customize some basic attributes of the cancellation form. At this first step, you're only editing the icon and messaging on the top, and the button, link, and background colors. Next, you'll create, add and re-order reasons for cancellation. If you'd like to change one of your existing reasons to something completely different, we strongly recommend removing the reason via the X button and creating a new box. Each box is a data point that should only be tied to a single reason. Simple edits are fine, but it you change the reason from "Too expensive" to "Too hard to use", the data we've collected for customers that chose that box will be mixed together.